The itinerary commences with the street of Ischia Porta, with its natural harbour located in a volcanic crater of the IV century. Once in the piazza del Redentore (square), you can visit the neoclassical Church of Saint Mary of Porto Salvo with its three great paintings of the Neapolitan school. From Porto, you arrive in Ischia Ponte, an old fishing village, built to connect the village to the island where the Aragonese Castle now stands. You enter the castle by climbing up a tunnel built by Alphonse of Aragon or by modern lift. At the summit, you can visit the Church of the Immaculate Conception and the sixteenth century Convent of the Poor Clares, in the basements of which are interwoven the legends and traditions of the cemetery of the nuns. The last stop is the Cathedral dedicated to the Assumption, dating from the XII century but rebuilt in the Baroque style (famous for its fourteenth century baptismal font) and the Church of Saint Peter a Pantariello. In Casamicciola, there is a “little gem” of eighteenth century architecture, the Church of Mary of Grace. 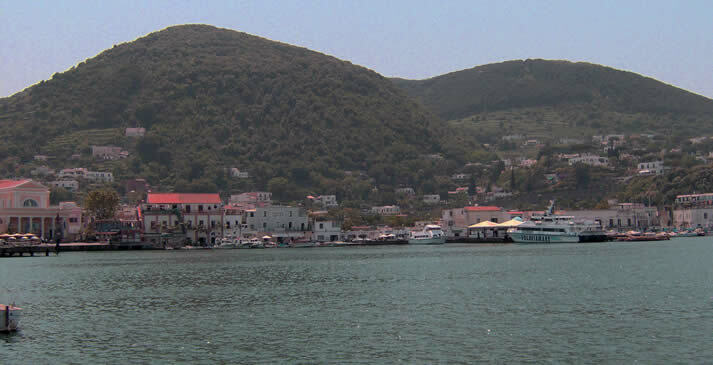 After Casamicciola, you reach Lacco Ameno, the landing point of the Greek colonists. Here, during an important archeological dig the famous Nestor’s Cup was recovered, in which a Greek epigram is engraved in three lines, the contemporary with the poems of Homer. From Lacco, you arrive at Forio d’Ischia, where you find the true Ischian symbol, the Church of Santa Maria del Soccorso, in whose entrance is decorated with polychrome ceramics and ex votos by fishermen who escaped the tempest. You then arrive in the highest town of the island, Serrara Fontana, which lies at the foot of Mount Epomeo. On this summit is the fifteenth century church of Saint Nicola. Lastly, is the town of Barano. It is in Piazza San Rocco, enveloped in a beautiful landscape, that there is the parish of Saint George, whose existence is recorded since 1300.